The PSU505 is a DC power supply with 3 programmable outputs and 12-bit resolution. The total output power is 210 W: channels 1 and 2, 30 V/3 A, provide 90 W each; channel 3, 10 V/ 5 A, puts out 30 W at a constant rate. Channel 1 provides outputs in serial and parallel modes; channel 2, in serial mode only. On channel 3, the user can perform auto-ranging, a feature not found on traditional power supplies. The user can monitor OVP (overvoltage protection) and OCP (overcurrent protection) on the front-panel LCD. Because of its 0.01% load-and-line regulation and 50 ms max response time, the PSU505 remains stable even when the voltage source and load change. 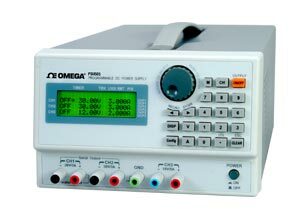 The PSU505 is also highly efficient, with an average measurement time of 50 ms. The PSU505 is easy to use, featuring an adjustable tracking function, a rotary selection dial, and an alphanumeric keypad. With the timer function, the user can control when each output is switched off (1 second to 100 hours); this feature is particularly useful in burn-in-room and electroplating applications. Up to 100 configurations can be stored in memory. A key-lock function prevents users from changing the original settings.